The Centre’s team at Bonaly opened the 2019 season by welcoming Explorer Scouts from Cockenzie who were taking part in the Zodiac Gold Award. This involves camping out for one night every month during which they must complete 12 of the 30 Zodiac Award Challenges. 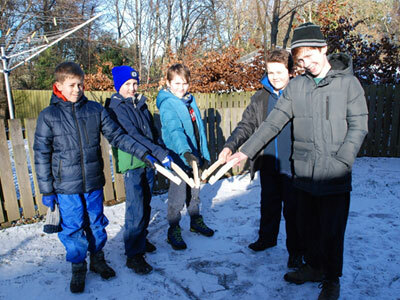 They were followed by the arrival of Scouts from the 2nd Haddington who had an exciting weekend using the Chalet as a base for their activities. This is an annual event each January where they learn new skills such as whittling tent pegs, enjoy a wide range of exciting activities and are rewarded with an amazing meal on Saturday night. This annual event is known as the “Big Nosh” for obvious reasons. Congratulations to the 200 Leaders and Scouts who braved the elements and took part in Pentland District Brass Monkey camp. This is also an annual event organised by a very experienced team of Leaders who created lots of skill challenges to keep everyone moving and warm during the sub-zero temperatures. I have to congratulate Simon on his crystal maze experience. It was an ingenious construction. Many people were involved over the two days and we were particularly impressed by the attention to detail ensuring the safety of everyone and the delivery of hot food and drinks throughout the event. This wasn’t easy given the problem of frozen water pipes. Well done everyone.